I'm certain that most of the people reading this have heard about setting goals and the importance of having a goal (or target) to get ahead in the business world. I'm just as certain that it makes perfect sense when I say that you need an address (or target) for your maps app to get good directions to your destination. It is the same principle with your color management strategy - without a target, you are shooting in the dark. I've been involved with the color management boot camp here at SGIA for three years now. One question we ask at the beginning of the class is whether the students know what their input profile "target" is in their RIP level color management settings. Overwhelmingly the answer is no, they do not know what those settings are, nor do they know what they are in their design software. When talking about targets, I'm specifically referring to the "input profile target" that is set in all RIP software when you bring in a file to print. 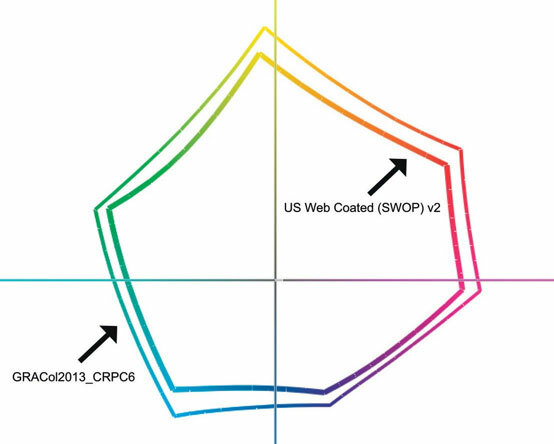 In the example shown from the Onyx "Quick Set" screen for a Roland (SGIA Expo Booth #601) LEC-330 (see Figure 1), see that the "Profiles" tab shows the targets for CMYK Image and Vector, which is US Web Coated (SWOP) v2.icc, and that the RGB Image and Vector are set to sRGB_IEC61966_21.icm (sRGB). Different RIP software will have different default settings for this, but it's important to note what the settings are in your RIP software you're using. Now take a look at the example from Adobe Photoshop (see Figure 2) - check out the similarities between its working space (RGB = sRGB and CMYK = US Web Coated (SWOP) v2) and the input profiles in Onyx. I spoke with Bryan Manwaring, Director of Product Marketing at Onyx Graphics, Inc. (SGIA Expo Booth #2435) and he confirmed that there is a reason for this setup after all! Onyx knows that a lion's share of the artwork being created is done in Adobe, and they also know that most people have no idea how or where to change their color settings so they are running with Adobe's defaults. Not having these settings match would cause colors to shift, so understanding what is going on and knowing why you would make certain selections is one of the goals of this article. 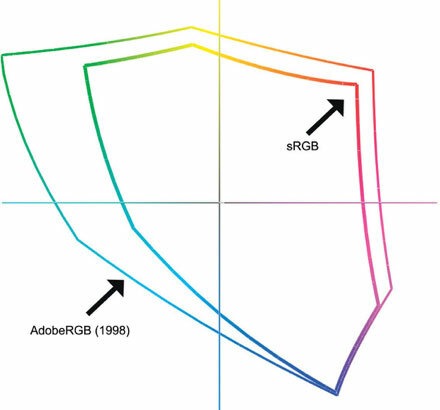 I've experienced a color shift and all I did was change from sRGB to AdobeRGB - see Figure 3 to see the gamut maps of sRGB vs. AdobeRGB (1998). Next, I convert my working space to GRACol 2006. When I look at the values to note the changes I see that CMYK values are the same, however L* = 49, a* = 74, and b* = 58, and RGB has changed to R = 196, G = 20, and B = 27. Again, all I did was change the working space from SWOP to GRACol, yet I've experienced a color shift. See Figure 4 for a comparison of GRACol2013 to SWOP. Notice that a color shift is observed even when going from a smaller (SWOP) gamut to a larger (GRACol2006) gamut or from a smaller sRGB to Adobe RGB. 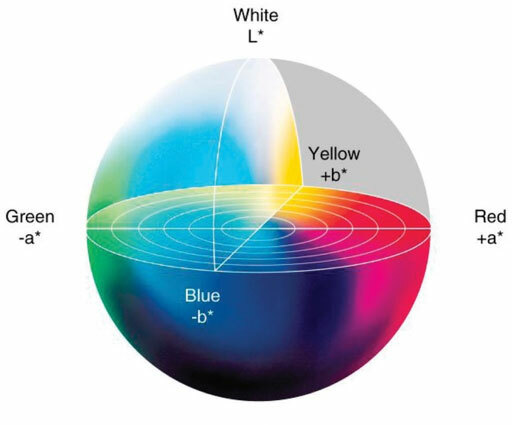 A logical question to ask is why would there be a color shift - certainly the larger gamut can reproduce all the colors that the smaller gamut can, right? What's happening is when the input profile/target is changed, the software tries to match the color (either the R=255 in the RGB example, or the CMYK example where C = 0, M = 100, Y= 100, and K = 0 - in both cases a block of red). When the larger color space is selected, it causes the software to adjust the color to its best match within the larger color space. These transforms occur any time you go from one color space to another, and minimizing them should be your goal. This is why targets are so important and why it is critical for you to know what your targets are in your RIP software so that you know what is happening behind the curtain with the color transforms. Whether you change them or not, knowing where they are and what they are set to is a must for all good color professionals. Think about the earlier example where I showed you the Onyx default settings of US Web Coated (SWOP) v2 and sRGB. Manwaring emphasized two other things when you are in the Quick Set menu. The first is that if you look just under the Color Management section, there is a dropdown menu that has a number of choices such as 3M Matchprint CMYK, Recommended G7 Profiles, Japan Standard, etc. Choosing one of these will set the input targets for you according to these choices. Secondly, there is another box when you are in the Change Profiles dropdown - it's the one marked "Use Embedded Profile When Available." This will cause the RIP software (in this case Onyx) to use the profiles embedded within the file - always a great idea when you are using files supplied by your client. Do recall that the default working space in Adobe is the smaller gamut sRGB and SWOP - so for files that you are creating, one of the first things to do is change those to AdobeRGB and GRACol2013_CRPC6 (CRPC stands for Character Reference Print Condition and the number 6 defines the specific one), which is included in the PhotoShop settings. You may need to find and download it for Illustrator. You can find information and the GRACol Reference Print Conditions (targets) on IDEAlliance's website and download them so that you can use them in your design software and in your RIP software. There are very few reasons to leave color on the table when you are designing projects for your customers - and when you use the default settings as your color space with any of the Adobe software programs, that's exactly what you're doing. When you do change them, make sure that you make the change across all devices and programs to avoid color shifts whenever possible. All RIP software have the same options available, but it's up to you to dig a little to find out where they are - and if you are struggling to find them, reach out to your software manufacturer. Before we go any further, I'd like to mention the main differences between GRACol2006 and 2013. First, the white point of the paper is shifted from b* -2 to b* -4, which is a bluer white point reflecting a more realistic media white point. Second, GRACol2006 used M0 as its measurement condition instead of M1. 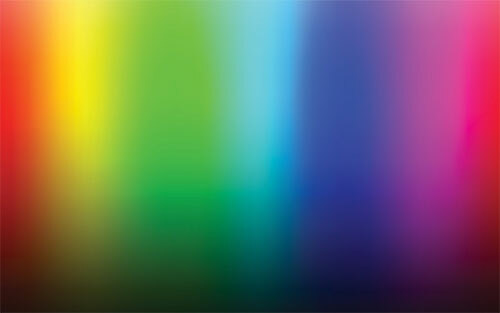 M0 is rarely used by color professionals since the light source is not calibrated, as opposed to M1 where the light source is calibrated to D50 (a known value) and the correct UV component. I talked with Dan Gillespie, Director of Technical Services at the Color Management Group, to get his thoughts on using targets. One of the points he made was to make sure you understand the expectations of a project. For example, in a "campaign" where there are many pieces being produced on a variety of devices, it makes sense to shoot for the lowest common denominator (say SWOP, for instance) so that all devices are targeting a gamut that is achievable. Specifying GRACol2013 is great for a digital printer that will be running the panels for an exhibit display, but if there is print literature in the booth and you want the color to match, then all devices should be using a target that they can all achieve. Gillespie also mentioned that in photography and fine art reproduction, it is common to keep files in the AdobeRGB space, as it has a very large gamut that should encompass most any printer gamut. You shouldn't be losing any color that could have been reproduced by choosing a smaller RGB space like sRGB. Additionally, Gillespie discussed the G7 method of adjusting the curves across all devices for a common visual appearance - without using profiling, per se. 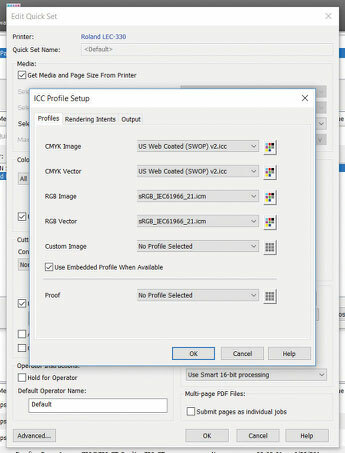 Lastly, when we were talking about default settings in RIPs, he noted that when using EFI (SGIA Expo Booth #1501), each print setup is named for the target that is used. 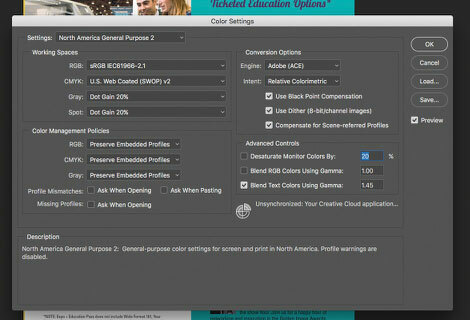 When you are using EFI and setting up a new workflow, you would select a target (say, FOGRA39 or SWOP) and that would set your color space. So far, I've only talked about a few of the possible input profiles that are available. There are many out there from FOGRA, to Euroscale Coated/Uncoated, to Japan Color, and each of them is a distinct and different color space. You may be asking, "Why so many, and why do I need to worry about them?" Mostly because we are in a global environment, and there could be instances when FOGRA39 is specified as the color space because the company is headquartered in Europe, and they want all colors to match what they have done up to that point - and you need to know how to accomplish that. Finally, I think it's important to talk about a tool that all color professionals should consider. Chromix's Color Think (or Color Think Pro) has many features - too numerous to mention individually - but the feature that I use most often is the gamut map tool. The images that I've shared in this article regarding gamut maps were all generated using this software, and it helps to see the graph of a gamut to understand the impact of choosing one color space over another. For instance, in Figure 5, it's interesting to see just how similar the gamuts are when looking at Coated FOGRA39, versus Japan Color 2001 Coated, versus GR ACol2013_ CRPC6. 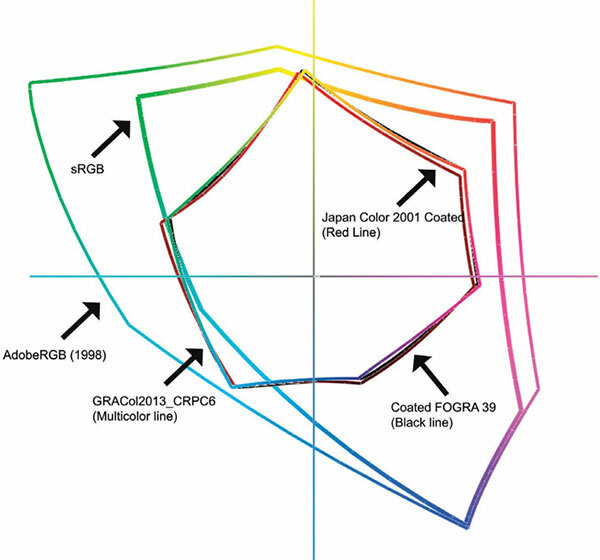 Another very interesting note (at least to me) is the comparison of Adobe RGB and sRGB, particularly as it relates to any of the CMYK gamut maps. See how sRGB clips back the color in the cyan range. This would be a great example of color that is lost because of the selection of an RGB color space that is smaller than the CMYK output potential of your printing device. My goal in this article was simple: Help illuminate the world of color targets and help you understand the implications of your choices - or even the decision to make no choice. Staying aware of options as they are introduced is important, as changes (though slow at times) are happening constantly. To learn more about color management, consider one of our SGIA Color Management Bootcamps and check out our Digital Color Professional Certification program by visiting SGIA.org. Have a colorful day! Ray Weiss, Digital Imaging Specialist for SGIA, joined the Association in 2014. He provides solutions and technical information on digital printing as well as digital equipment, materials, and vendor referrals. He oversees several workshops at SGIA along with the association's digital equipment evaluation program and is responsible for the color management certification program. Ray is a regular contributor to the association's Journal and won the 2016 Swormstedt Award for Best in Class writing in the Digital Printing category. His 25+ year career in the graphics industry has spanned owning his own prepress and offset business to digital wide format sales, training, support, and service. Ray has extensive experience in color management and worked closely with the Smithsonian Institution to implement a color managed workflow in their Exhibits department. This article appeared in the SGIA Journal, September / October 2017 Issue and is reprinted with permission. Copyright 2018 Specialty Graphic Imaging Association (www.sgia.org). All Rights Reserved.